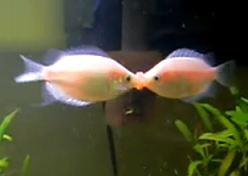 Kissing Gourami is an interesting fish that will never fail to thrill even novice fish keepers. In fact, their actions and behavior are so adorable that sometimes people thought they were actually kissing each other as a lover. That’s actually not true because the lip-locking act is a test of strength between two male kissing gouramis especially seen during the breeding season to impress the females. However, there is nothing to worry about because the act would not actually cause harm and injury to the other party. Basically, there are two variants of the fish, one which is green in color and another is the normal pink color which are commonly found sold in pet stores. If you intend to mix your kissing gourami with other community fish, I would suggest you take a careful approach to introduce and then observe closely whether they might attack other species. Mixing with smaller fish like neon tetra, danio, guppy, platy and swordtail is not an option here because they can ended up being harassed or hurt by the larger sized kissing gourami, most problematic especially with their aggressive fin-nipping behavior. So far, among potential tank mates that can live with them are certain species of cichlids like firemouth, kribensis, bolivian ram cichlids and even though they can be territorial, as long as there is large enough aquarium space, there should not be any problem. Other species compatible with kissing gourami include clown loach, pleco and silver dollar fish. Similar like any other tropical fish species, both the green and pink kissing gouramis will thrive well in warm and soft water with neutral pH. When it comes to food, they have no particular preferences and will generally accept whatever that you feed to them. In fact, most of the time, they will scour the bottom gravel bed looking to consume off the algae appearing in the aquarium and having them around will usually help towards having a clean well-managed tank. Kissing Gourami is also an intelligent fish because they can actually recognize the owner who feeds them and swim happily from one end to another upon seeing you. They also have a long lifespan and if properly cared for, can live up to 15 years and above. Because of that, they make a perfect pet for every home aquarium. Find out also which is the best pet fish for young kids.